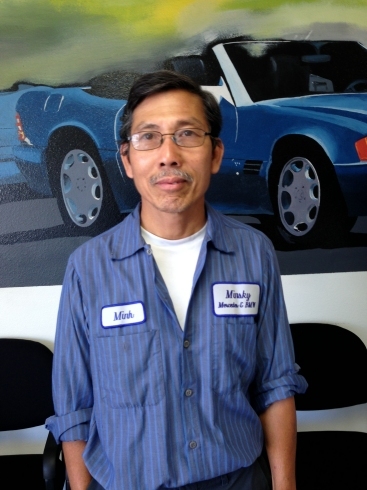 Hi there, I'm Minh Nguyen, owner of Minsky Mercedes-Benz Specialists in San Diego. With dozens of years of experience in European and Luxury auto repair, we're proud to be known as the premier auto specialty shop in San Diego and Kearny Mesa. As San Diegos experts in European and Luxury vehicle service, our team of extensively experienced technicians offer world-class service in everything Mercedes Repair. Our Mercedes Engine Repair team takes exceptional care in ensuring your Mercedes' engine, whether it has 5k or 500k miles, gets the proper treatment it deserves. German-tuned performance can take it's toll on your brakes - let our Mercedes Brake Repair specialists keep you at 100% stopping power. Keeping up with your Mercedes Scheduled Maintenance is essential to a long life for your Mercedes Benz, whether it's factory scheduled maintenance or something as simple as a routine tire rotation. The Mercedes service technicians at Minsky Mercedes-Benz Specialists utilize the latest factory diagnostic equipment, specialized tools and training to determine to keep your Mercedes driving like it just came off the lot. "They have always met and exceeded my expectations and are.."